Ever wondered why some people can wear florals with flair while on others it looks too feminine and… flouncey?! Why some can slink around in leopard print and snakeskin and others just can’t pull it off?! The answers are in the stars! Zodiac Fashion, Print And Pattern! There’s print and pattern styles assigned to each sign, as the zodiac rules over everything and anything! The first sign of the zodiac, Aries is the initiator that steps boldly into battle, so for these folk it’s just gotta be Aztec! Mars ruled, this sign can adopt an ardent energy that’s similar a fearless warrior, so they suit the spirit of the print perfectly. Aries can embrace any pattern worn in war including camouflage. I’ve written more about her style in The Aries Warrior Queen and Aries Rules Camo! Taurus folk suit floral patterns, which can be big and blossoming or tiny delicate flowers. They’re one of the most popular and re-occuring prints seen on the catwalk season after season, so flower power is so worth considering if you have planets in the sign, or want to adopt a Taurean state of mind! “She wore an itsy bitsy teenie weenie yellow polka dot bikini” could be a song about a Gemini gal. This sign looks super dupa in spots – they’re bouncy, bright and never heavy weather, just like the Twins! 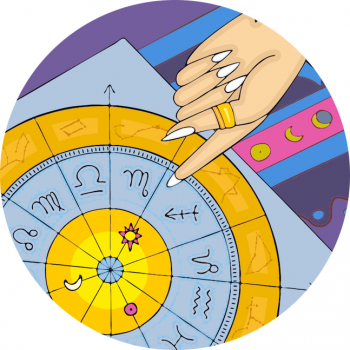 Work with them large or small – in Gemini’s birthday months or all year! Gemini also rules prints with birds and butterflies. Cancerian’s can do the Highland Fling and go to town with Tartan! As rulers of clan and communities, the sign of Cancer the Crab is the protector of families and children (and of course this feminine sign suits a skirt – or kilt!) It’s a pattern associated with home and nostalgia, and don’t forget this tribal pattern is also linked to war of a protective nature, so it suits the Cardinal spirit of the sign… I’ve written about the Tartan Trend for Jupiter In Cancer here. Resonating with Leo are royal or regal prints, crest patterns and embellished touches – read Baroque Baby! As the dramatic and theatrical sign, Leo loves gilt and gold and fashions that draw the eye, with any fabrics that feature embellishment coming under the Lion’s rule. Hearts too are ruled by Leo, and big cat prints are shared with Scorpio! Read more about luscious Leo or discover Leopard Print in astrology, here. Really and truly, Virgo is the overall ruler of print and pattern. They suit Paisley print, with it’s tiny details and earthy tones. People born under the sign of the Maiden can really pull off print better than all the other zodiac signs, I’ve written more in Virgo, Print Perfection and they should add pattern when they can! Balanced like the Scales, Libra suits design that’s symmetrical in style. Clean, parallel lines work best, Libra suits streamlined fashions and patterns. This super-civilised, Venus-ruled sign looks over architecture and beautiful buildings so pattern that features an architectural vibe belongs to Libra too! Scorpio is the sign of transformation, and suits the skin of reptilian beasts that shed and shape-shift – exotic snakes and more. They can also wear tough leather, reminiscent of strong, hardy insects with shiny shells like beetles, or their Scorpion representative. The class clown of the zodiac, Sagittarius needs a print that can match their larger than life attitude. Pattern associated with Capricorn can be antique looking. Fabrics like lace and the traditional tweed and country classics are Capricorn ruled. Remember one of the colours of Capricorn is a lovely sage hue, and also olive green. This is a respectable sign with a serious authority so they can carry off patterns that carry a conservative tone. Read more about classic Capricorn or more in Capricorn, Embrace Lace! Aqua babes need something a little off the wall, quirky or different when it comes to their style. Consider new age digital prints, contemporary patterns and flower power hippy styles all work well. Zig zags, pixilated prints and modern design is Aquarius ruled, as well as any look defined by a rebellious faze. Pisces people suit free flowing fashions and clothes that don’t restrict or fence them in. This sign is creative and dreamy and should keep it light and loose. This Neptune-ruled sign can go nautical too, with stripes and seaside touches. The number one tip for Pisces? Don’t define your style, stay fluid fish!